The Oklahoma Department of Wildlife Conservation has promoted three Game Warden Lieutenants to the rank of Captain, and each now serves as District Chief for his law enforcement district, said Bill Hale, chief of Law Enforcement. They are Capt. Jeff Headrick in District 7 (Beckham, Custer, Dewey, Ellis, Greer, Harmon, Jackson, Kiowa, Roger Mills, Tillman and Washita counties), Capt. David Robertson in District 2 (Adair, Cherokee, Haskell, McIntosh, Muskogee, Okmulgee, Sequoyah and Wagoner counties), and Capt. Wade Farrar in District 5 (Carter, Cleveland, Garvin, Lincoln, Logan, Love, McClain, Murray, Oklahoma, Payne and Pottawatomie counties). There are eight operational districts in the Wildlife Department’s Law Enforcement Division. The new captains are assuming the positions held by Thor Carlson of Colony, Joe Adair of Tahlequah and Tony Woodruff of Lexington, all of whom recently retired. 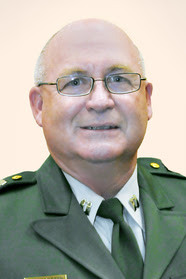 Headrick began his Wildlife Department career in 1989. Currently a Burns Flat resident, he has lived and worked his entire life in District 7. Born in Hobart, he resided in Lone Wolf and graduated from Lone Wolf High School in 1981. He worked as a Game Warden for 23 years, and in 2012 he was promoted to Lieutenant. 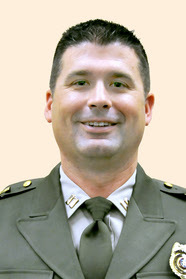 In his new position, Headrick will supervise two Lieutenants and nine Game Wardens. “I have two exceptional Lieutenants with 48 years’ experience between them and an outstanding group of professional Game Wardens that are dedicated to protecting the resources and serving the sportsmen, wildlife enthusiasts and landowners of our great state. Robertso n began his career with the Wildlife Department in 1990 as a Game Warden assigned to Latimer County. In 1996, he transferred to a dual assignment in Okmulgee and McIntosh counties, which was his home area. “I was fortunate to have family members with a strong hunting and fishing heritage,” he said. “They made sure I was introduced to the outdoors at an early age, and I never turned back. During his 27 years on the job, he has served as a field training officer and as an instructor with the Shotgun Training Education Program. In 2012, he was promoted to Game Warden Lieutenant. “I am truly honored to serve as District 2 Law Enforcement Chief. I am excited and eager to lead District 2 Game Wardens as we continue to serve the sportsmen and women with the highest level of integrity as well as meeting any challenges we may face. “I strive to have a positive influence in wildlife law enforcement,” he said. Robertson enjoys hunting, fishing, raising cattle and spending time with family. He and Nita, his wife of 38 years, live on the family ranch. They have three adult children and nine grandchildren. As District 2 Chief, Robertson supervises two Lieutenants and 14 Game Wardens. Farrar was hired in 2003 as a Game Warden based in Oklahoma County, Since 2007, he has been based in Logan County, the past 3.5 years as a Lieutenant. He was raised in Crescent and graduated from high school there in 1997. He originally wanted to attend medical school, and from 1998 to 2006, he served as a medic in the Air Force Reserve. It was during this time that he met Game Warden Joe Adair’s son, who happened to be a fellow reservist. Adair’s son suggested to Farrar that he should consider becoming a Game Warden, and that’s what sparked his interest. 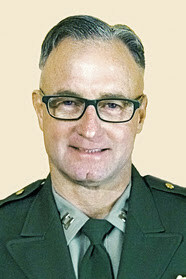 During his career, Farrar has served as Law Enforcement Division Honor Guard commander, Wildlife Youth Camp director, Game Warden liaison to the Oklahoma Emergency Management System, Law Enforcement representative for hunting and fishing regulations guide, and teacher of a Wildlife Law Enforcement class at Oklahoma State University. He and his wife of 15 years, Kelley, have two sons and live in Cashion. In his spare time, he enjoys working cattle and team roping, hunting, fishing and serving his church. The Law Enforcement Division is responsible for upholding the laws and regulations that protect Oklahoma's wildlife resources. Game Wardens interact with the public. They often spend time visiting landowners in their county, encouraging them to allow ethical hunters and anglers on their land to harvest the surplus wildlife. They may assist the landowner with poaching problems or give them information about stocking fish in a pond. They occasionally visit with sportsmen's clubs, schools, scout groups and civic groups. They may speak about new laws and regulations, or about some topic directly related to hunting or fishing. They may also pass along printed information published by the Wildlife Department. Game Wardens also frequently help teach hunter education courses and fishing clinics.